I recently got a new Cannondale bike. Since I am new to riding this type of bike, a road bike, I wanted to test it out in a safe environment that was not too congested and where I could land softly if I were to “crash and burn.” So, my new bike and I headed east to the Shelby Bottoms Greenway. This beautiful greenway is tucked away along side the banks of the Cumberland River. I set out to ride 10 miles, and was close to the half way point (3.75 miles to be exact) when I approached this very large bridge. 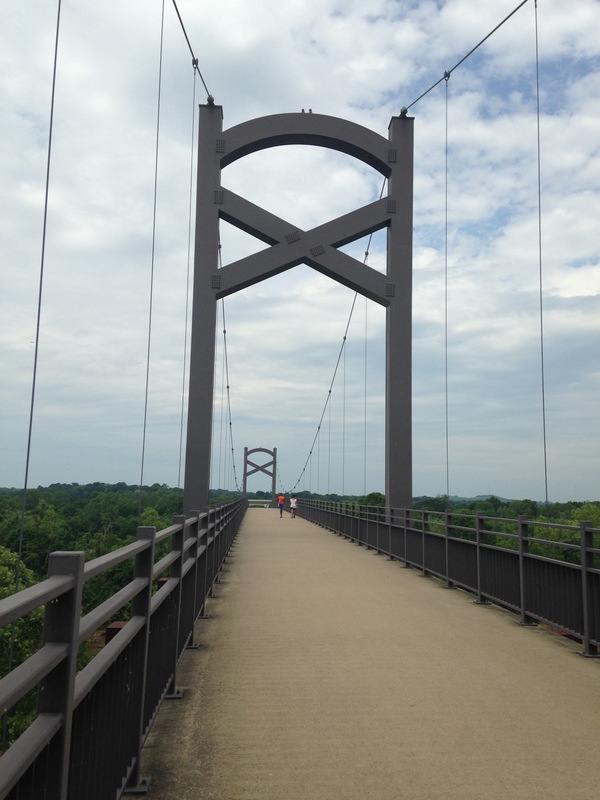 The Cumberland River Pedestrian Bridge serves as a connection point, a thoroughfare that connects Shelby Bottoms Greenway to Two Rivers Park – a park off of Briley Parkway near Opryland Hotel. 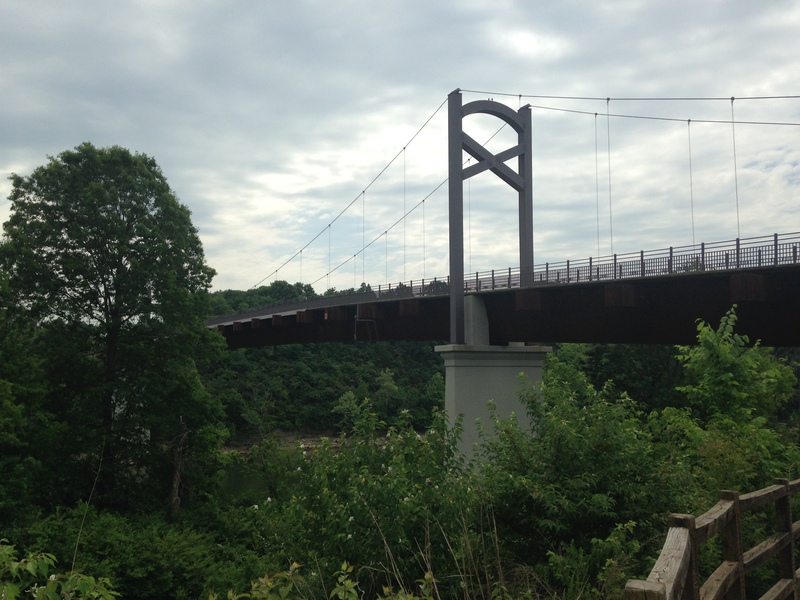 This public bridge links 22 miles of walking and bike trails. For without this bridge, people and neighborhoods could not “connect” and enjoy the trails as they were created for. I made my way to the top of the bridge, which was a journey in itself, and stopped to take in the sights, and most importantly, catch my breath. 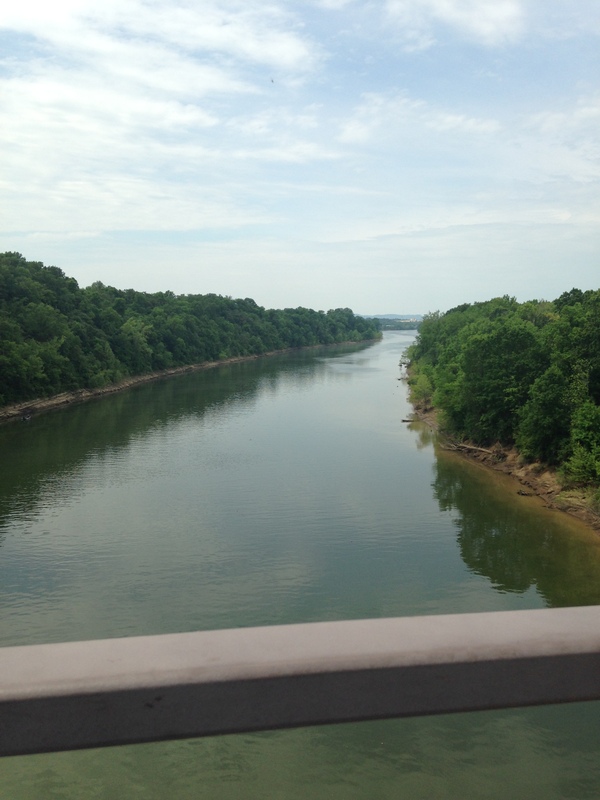 The view was breathtaking and the wind blowing off the peaceful Cumberland River provided me relief from the heat. I wanted to stop time for a brief moment. As I stood there, absorbing all the beauty surrounding me, I starting thinking about what qualities it would take for me to be more like a bridge. I want to be a vessel that helps people connect to new ideas, people, and experiences. 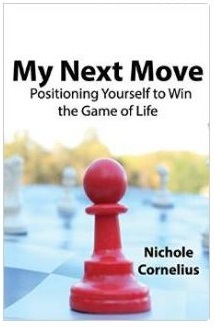 I want to help people “cross over” into new territory such as healing, freedom, and love. In order to be a bridge, I have to be transparent, real, and “open” to connect with others not quite like me. I also have to be firm and resilient. Those who cross paths with me may resist my ideas or actions. They may not freely engage with me. I cannot be like others, either. I have to be my true authentic self. They may not share in the same experiences that have shaped and molded me into the person I am today and the experiences that are needed to help others. I need to stick true to my own path. Also, I need to find my voice and my platform. I can no longer sit back and bury my words out of fear of how others will perceive them. Bridges are meant to be crossed and provide connection, no matter if others don’t walk similar paths. I rode my bike again this past Saturday and actually rode the entire length of the bridge. I really had no idea where I was going, but I decided to trust the path that the bridge had given me. It turns out, I was on the other side of Briley Parkway, the place where the giant water parks sits on Exit 10. I know this place well. I’ve driven by it many, many times over the course of living in Nashville, Tennessee. It turns out this place was not so scary. It was just another beautiful park filled with new trails to explore, new people to engage with, and new beauty to absorb. All that was needed to get to this new place and experience, was the courage and the desire to cross this one bridge. Maybe your purpose is to not be a bridge, but to simply cross one. Maybe like me, you have stood on the banks admiring the view, but never found the guts to cross over. Connection is scary, it is risky, but it is vital for us to live enriched lives. There is a great big world waiting to connect with you, your ideas, your experiences, and most importantly, your heart. Don’t let fear of the unknown stand in the way of you experiencing something truly amazing. Don’t deny yourself of what you were created for – connection.